Welcome to Episode #28 of the Living Homegrown Podcast! 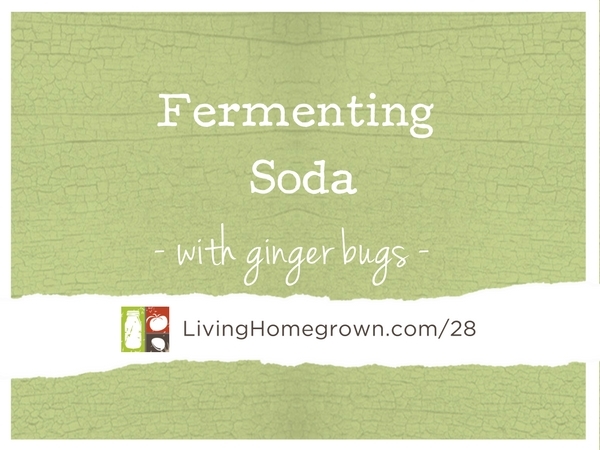 In this episode is all about how to ferment your own home brewed Ginger Ale using a ginger bug. What is a ginger bug??? It is a wild yeast starter that helps you create your brew. Listen in for ALL the details or read the transcript below. I’m so exited to try this, Theresa! I’ve had success with making beet kvass and kombucha, but neither were popular with the rest of my family. Dare I ask, how would I make this an alcoholic beverage? Interesting. I use a recipe for ginger syrup from Sara Moulton and make ginger ale with my Soda Streamer. I was very interested in your juicing techniques to make other homemade sodas, but have not tried this yet as I don’t have a juicer like yours. I also was considering using my counter top juicer to see if I could make flavored syrup to use for soda. Have you got any ideas for me on this? I feel there must be a resource some where for this that I have not found. Keep up the good work, Theresa. This was very interesting. Well Craig, you should be able to make a standard syrup with any juice. Typically, it would be 50% juice and 50% sugar. (heated in a pan until sugar dissolves) I have never used a soda Streamer, so I don’t know how sugary the syrups are for them. But 50/50 is pretty standard for a mixed drink syrup – like for cocktails. So it may work for the streamer. I’m just not sure since I have never used one. I started my ginger bug yesterday and was asking myself if I need to skin the ginger. I’m guess no for that is where the yeast is? I do not peel the ginger Jeff. I should have said that in the recipe. I will go back and add that note. It is okay if you do peel it but I think you have better ferment with the skin on.